Twenty years ago, Kerm and Sallie Campbell learned about the listing of a gorgeous 120-acre farm near Suttons Bay, complete with a plantation-style home, centennial barn and indoor and outdoor equestrian facility. Rounding up three partners and a young winemaker, Black Star Farms began. Happy birthday, Black Star Farms! "If anyone orders merlot, I’m leaving. I am NOT drinking any f***ing merlot!” So said oenophile Miles Raymond in the 2004 movie Sideways — and many moviegoers apparently took his condemnation of the grape to heart. 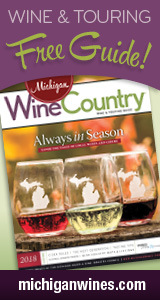 In her latest Hour Detroit Michigan wine blog, Cort talks to Michigan winemakers about why they believe Merlot deserves your attention. Attention red wine lovers! Blank Star Farms will soon be getting a special piece of equipment that will help them and other wine makers to produce better quality red wine. Just last week, Black Star Farms found out they were awarded a $210,000 grant from the Department of Agriculture. The winery applied for the "Value Added Food Processor" grant back in April. It was one of 51 proposals that the state considered. Congrats to Heather Fortin and the Black Star Farms team!